The enormous advances in digital signal processing (DSP) technology have contributed to the wide dissemination and success of speech communication devices - be it GSM and UMTS mobile telephones, digital hearing aids, or human-machine interfaces. Digital speech transmission techniques play an important role in these applications, all the more because high quality speech transmission remains essential in all current and next generation communication networks. Enhancement, coding and error concealment techniques improve the transmitted speech signal at all stages of the transmission chain, from the acoustic front-end to the sound reproduction at the receiver. Advanced speech processing algorithms help to mitigate a number of physical and technological limitations such as background noise, bandwidth restrictions, shortage of radio frequencies, and transmission errors. This text is an invaluable resource for engineers, researchers, academics, and graduate students in the areas of communications, electrical engineering, and information technology. 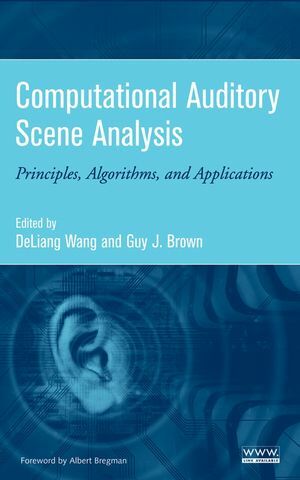 Peter Vary is the author of Digital Speech Transmission: Enhancement, Coding and Error Concealment, published by Wiley. 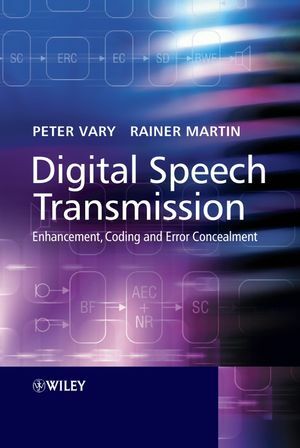 Rainer Martin is the author of Digital Speech Transmission: Enhancement, Coding and Error Concealment, published by Wiley. 2 Models of Speech Production and Hearing. 2.1 Organs of Speech Production. 2.2 Characteristics of Speech Signals. 2.3 Model of Speech Production. 2.5 Performance of the Auditory Organs. 3.1 Fourier Transform of Continuous Signals. 3.2 Fourier Transform of Discrete Signals. 3.3 Linear Shift Invariant Systems. 3.5 The Discrete Fourier Transform. 4 Filter Banks for Spectral Analysis and Synthesis. 4.1 Spectral Analysis Using Narrow-Band Filters. 4.2 Polyphase Network Filter Banks. 5 Stochastic Signals and Estimation. 5.7 Estimation of Statistical Quantities by Time Averages. 5.9 Estimation of the Power Spectral Density. 5.10 Statistical Properties of Speech Signals. 5.11 Statistical Properties of DFT Coe.cients. 6.1 Vocal TractModels and Short-TermPrediction. 6.2 Optimal Prediction Coe.cients for Stationary Signals. 7.1 Analog Samples and Digital Presentation. 8.1 Classi.cation of Speech Coding Algorithms. 9 Error Concealment and Softbit Decoding. 9.4 Softbit Source Decoding (SD). 10 Bandwidth Extension of Speech Signals (BWE). 10.2 Speech Coding with Integrated BWE. 10.3 BWE without Auxiliary Transmission. 11 Single and Dual Channel Noise Reduction. 11.3 Speech Enhancement in the DFT Domain. 11.5 Joint Optimum Detection and Estimation of Speech. 11.6 Computation of Likelihood Ratios. 11.7 Estimation of the A Priory Probability of Speech Presence. 11.8 VAD and Noise Estimation Techniques. 12.2 Spatial Sampling of Sound Fields. 12.4 PerformanceMeasures and Spatial Aliasing. 12.5 Design of Fixed Beamformers. 13.1 The Echo Control Problem. 13.4 The LMS and NLMS Algorithm. 13.5 Convergence Analysis and Control of the LMS Algorithm. 13.6 Geometric Projection Interpretation of the NLMS Algorithm. 13.7 The A.ne Projection Algorithm. 13.8 Least-Squares and Recursive Least-Squares Algorithms. 13.9 Block Processing and Frequency-Domain Adaptive Filters. 13.10 Additional Measures for Echo Control. 13.11 Stereophonic Acoustic Echo Control. Digital Speech Transmission Visit the website to access supplementary information, programs and audio samples.